F, b. 2 October 1877, d. 13 September 1878? [S470] Scotland, Old Parish Registers, 259/ 0030 0159. [S470] Scotland, Old Parish Registers, 259/ 0030 0188. [S470] Scotland, Old Parish Registers, 259/ 0030 0205. [S89] Family Search, Parish registers for Fordoun, 1693-1854. [S470] Scotland, Old Parish Registers, 259/ 0030 0236. [S421] Chetham Society, Visitation of Lancaster, 1613, p. 37. [S422] Chetham Society, N.S. Vol. 28, p. 17. [S141] Unknown compiler, "Manchester University, John Rylands Library", Ancestral File, Crutchley Muniments CRU/108; CRU/110. [S422] Chetham Society, N.S. Vol. 28. [S422] Chetham Society, N.S. Vol. 28 p. 17. [S422] Chetham Society, N.S. Vol. 28 p. 16. [S302] Harry Pinckney Huse, Descendants of Abel Huse, p. 47. [S302] Harry Pinckney Huse, Descendants of Abel Huse, p. 43. [S90] Scotland, Statutory Register Index Deaths, 685/010135. [S94] 1891 British Census, Crail; ED: 1; Page: 5; Line: 11; Roll: CSSCT1891 126; Year: 1891. [S89] Family Search, Town and vital records, 1771-1892 Vassalborough (Maine). Town Clerk. [S89] Family Search, Vital records of Gardiner, Maine : to the year 1892 Webster, Henry Sewall (ed.). [S212] James W. North, The history of Augusta, p. 936. [S212] James W. North, The history of Augusta, p. 937. [S107] 1880 US Census, Augusta, Kennebec, Maine. [S117] The Times Newspaper, Thursday, Mar 24, 1870; pg. 1; Issue 26706. [S232] Ancestry.com, Quebec Vital and Church Records (Drouin Collection), 1621-1967. Québec (Anglican) (Québec (Anglican Cathedral Holy Trinity church)), 1937. Abby Webster3 b. 2 Oct 1877, d. 13 Sep 1878? [S470] Scotland, Old Parish Registers, 259/ 0030 0104. [S218] 1861 British Census, Scotland census. [S89] Family Search, Tasmanian civil records of births, marriages and deaths : births 1803-1899; deaths, 1838-1899, burials, 1803-1933; marriages, 1803-1899 Tasmania. Registrar General. [S470] Scotland, Old Parish Registers, 417/00600097. [S319] 1851 Scotland Census, Crail; ED: 1; Page: 8; Line: 1; Roll: 764; Year: 1851. 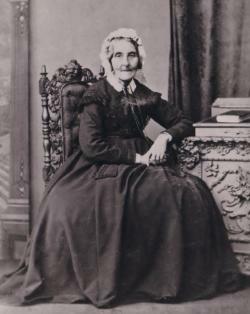 Janet Campbell (Jessie) Webster was born on 9 October 1801 in Fordoun, Kincardineshire.2,3 She was the daughter of Alexander Webster and Janet Campbell.1 Janet Campbell (Jessie) Webster was christened on 31 October 1801 at Fordoun, Kincardineshire.4 She married David Guillan Crombie, son of John Crombie and Elizabeth Guillan, on 7 July 1827 in Anstruther Easter, Fife, The Register of Proclamations and Marriages of the Parish of Anstruther, Fife of 25th June 1827 reads "Mr. David Guillan Crombie and Jessy Webster of the parish of St. Vigeans were contracted to be proclaimed the 1st July next and married 7th same month." The banns appear to have been read in St. Vigeans, Arbroath on 4th July 1827.5,6 Janet Campbell (Jessie) Webster was enumerated in the 1881 Census and described as being a farmer of 135 acres of which 120 were arable and employing 4 men, 5 women and 1 boy.7 She died on 23 May 1882 in Kilminning, Fife, at the age of 80.3 She was buried in Crail churchyard. [S607] Website billiongraves.com (http://www.billiongraves.com/) "https://billiongraves.com/grave/person/16521839#/." [S470] Scotland, Old Parish Registers, 259/ 0030 0132. [S89] Family Search, Old parochial registers for Anstruther-Easter, 1641-1854. [S89] Family Search, Parish registers for St. Vigeans, 1669-1854.